On Inspector Chopra's last day of work before retiring, a teenager's body is discovered. The boy was quite poor, and his family doesn't believe the police department will do anything to help them. Inspector Chopra takes this personally. Mumbai may be a city of tens of millions, but murder must be stopped no matter what. 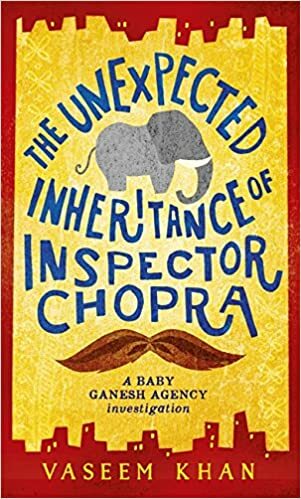 Not quite ready to retire and not very trusting of the inspector who has taken his place, Chopra begins to investigate himself. There are a lot of good points about this book that I think bode well for the series. First, contemporary Mumbai is very much a character in this book, and a heavily flawed character, at that. We see why the Inspector fell so in love with the city, why he's so frustrated with it now, and why it can be so overwhelming to so many people. The corruption at all levels of the Indian government are pretty obvious here, as is the extreme poverty that affects so many people. But there is also the delicious food, the many enterprising ways people make the city and their lives work, the cultures that have melded and stood for so many centuries. Second, the Inspector and his wife are getting older in life but have no children, which is quite rare in India. I look forward to seeing how Khan approaches this in future. Like many people over the past few generations, Chopra and his wife were from a more rural area and moved to Mumbai, so we see their perspective from both a more traditional upbringing and a very urban perspective. I really appreciated the way Khan brought all of this to life. Also, the adorable baby elephant. But there were things about this book that also were not quite so up to par. The mystery was solved in a bit of a clunky manner, clues turning up sometimes without any real work. While I liked Chopra and his wife, Archana (nicknamed Poppy), their relationship and the strange plot twist that came into the book around them was pretty bizarre and hard to believe. The writing just felt a bit amateur and rough around the edges. But I think it's worth trying the second book, especially if baby Ganesha has more of a role. Baby elephants are always a plus! Have you read the Vish Puri mysteries? I was just wondering how this compares because they sound somewhat similar. Puri doesn't have an elephant though! I have never heard of this before, but I am intrigued enough to check it out! I was very fond of this book!